Children’s book author Donna Washington grew up with storytelling all around her. At the dinner table, her father would share mesmerizing tales that sent Donna’s imagination soaring. In college, she studied speech and theater and learned she had a gift for storytelling too. Donna has won many awards and accolades for her work. Her recordings of “Live and Learn: The Exploding Frog and Other Stories” won a Parent’s Choice Award. Her CD, “The Sword and The Rose,” garnered a Storytelling World Award. Each year, she’s a sought-after performer at festivals, libraries and schools around the country. My path to becoming a published author begins in a most improbable way. I’d just finished doing a storytelling series for a book company out of Illinois. They decided to break out a few of the stories and turn them into wordless picture books. They sent me out to California to perform some of the tales and as I left the stage a woman walked up to me and asked if I would be interested in writing a book. Being young and foolish, I decided to do an anthology. It took twelve years from conception to publication. A Pride of African Tales (HarperCollins), illustrated by James Ransome, was the first book I wrote, but the second one to be released! I have always loved children’s books. My first love in book form was What Mary Jo Shared by Janice May Udry. I suspect it was because it was the only book I had where the characters looked like me. Seeing African American people doing normal things in a book made me very happy. My second love was Tikki Tikki Tembo. I loved the wordplay and the repetition. I can’t say that I remember the illustrations all that much. My favorite works are often stories that play with language and create amazing images whether you look at the pictures on the page or not. Eric Carle, Maurice Sendak, Shel Silverstein, Leo and Diane Dillon, Gwendolyn Brooks, Maya Angelou, and Madeline L’Engle are a few of my favorties. 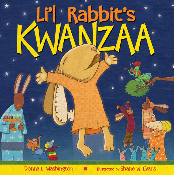 My most recent book is called Li’l Rabbit’s Kwanzaa (HarperCollins), illustrated by Shane W. Evans. I wanted to write a book that happens at Kwanzaa time bu t is not about Kwanazaa. There are not very many Kwanzaa books that are just for fun; most of them explain how the festival is celebrated. The book was received well and there were lots of reviews from websites that promote books for children. “I happen to see this book at my local bookstore when I was looking around for books for my 3.5 year old. I picked it up and read it and first thing that came to my mind was “what a cute story!” This book is great for kids . . . the illustrations grab the kids’ attention as well as the wording of the book. So this book is mother-tested and kid-approved :). FYI: At the end of the book, the seven principles of Kwanzaa are listed. So this is a must-have in your Kwanzaa or holiday book collection! My upcoming book is called Boo Stew and will be published by Peach Tree Press in Georgia. The story originateed during a roundtable storytelling game I play with my children. It is a play on Goldilocks. We are still in the illustrator stage, and I hope that it will be out in a couple of years. The heroine of the book is a young girl named Curly Locks who is a horrible cook. Despite her other fine characteristics, it is this lack of skill in the kitchen that ends up winning the day. The industry is changing. There are fewer companies producing fewer books. Cartoon characters and serials are the best selling books and many books cross over to the cartoon network. As companies compete with electronic media and video, more and more people claim that the print book is moving towards its end. As for me, I don’t think books will ever die, but we most certainly may reach a point where we no longer indulge in paper books. I personally will be sad if that happens, and I hope it won’t ever. How that will affect authors and illustrators, I don’t know, but I will be there, right in the middle of it, writing. Find out more about Donna Washington at http://donnawashington.com/index.html.